Paul Mitchell is an incredibly popular salon hair care brand based out of California. They are also known for their series of Paul Mitchell beauty schools throughout the US. Additionally, they claim to be the first professional beauty company to take a stand against animal testing. But is Paul Mitchell cruelty-free? They did not recommit to the Leaping Bunny program in 2017, so we reached out to them to make sure nothing changed in their policy. They confirmed that they don’t test finished products or ingredients on animals. They also stated that their suppliers don’t test on animals, and no third parties test on animals on their behalf. They don’t test on animals where required by law and their products aren’t sold in China. 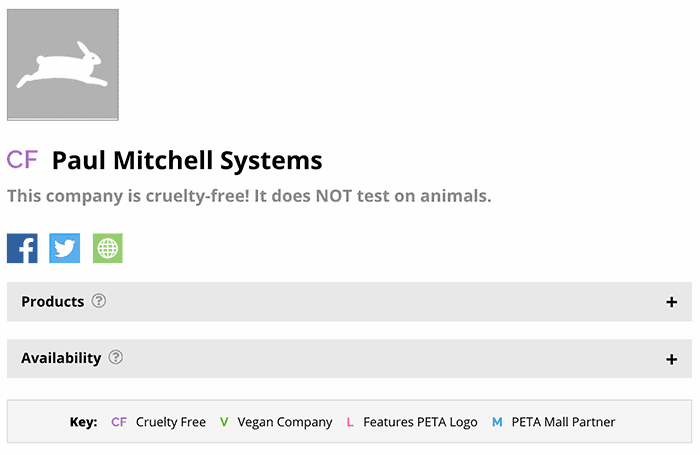 Paul Mitchell remains certified by PETA and does not have a parent company. Keep reading for the full policy as well as a Q&A. There’s also a list of Paul Mitchell vegan products at the end of the post. 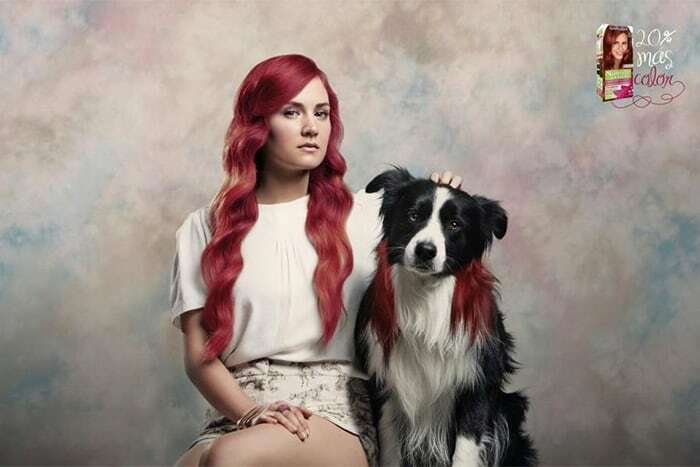 Paul Mitchell is certified by PETA as being cruelty-free. PETA also confirmed that Paul Mitchell does not sell their products in China, where animal testing is required by law for foreign cosmetics. Here at Paul Mitchell, we’re passionate about beauty from the inside out. And that commitment has been at the core of all that we do since we began in 1980. That’s why we were the first professional beauty company to publicly stand up against animal testing—and 37 years later, we’re still rockin’ that pledge to our furry friends. And you know what? We didn’t stop there. Because we love our animal friends so much, we’ve committed to carrying only vegan leather shear cases and styling accessories, and all of our brushes are made with synthetic bristles rather than animal hair (Because, surprise! Those animals aren’t “donating” their hair to the beauty cause.). In addition to being cruelty-free, nylon brushes are more hygienic since they’re easier to clean and repel bacteria more effectively than animal hair. That’s a win for you and a win for the animals! We’re so passionate about this cause that going forward in 2017, we’re featuring a new “No Animal Testing” logo on all of our products to emphasize and highlight our dedication. We want you to know that when you use Paul Mitchell, you’re making the world a more beautiful place … one fabulous hairstyle—and compassionate purchase—at a time. Since the policy on the Paul Mitchell website and blog isn’t complete, I reached out to ask them specific questions. Here are their answers, with my questions in bold. 1. Does your company test on animals, either for finished products or ingredients? 2. Do your suppliers test on animals? 3. Does your company hire or allow third parties to test on animals on your behalf? 4. Do you test on animals where required by law? No. Our products are only available in those locations (referring to salons, Loxa Beauty and Neon Hair). 5. Are your products sold in mainland China? Paul Mitchell is a confirmed cruelty-free company, and is included in our cruelty-free list! Image at the top: Paul Mitchell. My hair and spa salon is an exclusive Paul Mitchell salon, and I have been purchasing and using their hair products for years. Their hair care line is very extensive. I plan to purchase two or three Paul Mitchell hair brushes today. My favorite product is their Thicken-Up hair gel. Thank you for this wonderful article about my favorite hair products. I saw just saw this headline and almost freaked! Paul Mitchell has been my go-to brand for a while now. Very happy they are still CF! Hey guys ( I would usually say Suzi, but now that I know there are more employees) I was wondering if you could post about how to email and ask brands about their animal testing policy in a way where they will respond? Love the blog! Awesome I am only using his products now. I’m so confused with Paul Mitchell. They use sheep wool for their keratin and I’m on the fence. Isn’t this cruel according to my research on shearing sheep? There isn’t anything inherently cruel about sheering sheep. They need to be shorn or their wool will become overgrown, which *is* cruel. In the beauty industry, ‘cruelty-free’ tends to only refer to animal testing. I agree that the way that many animal ingredients are harvested is cruel, which is why it’s best to buy cruelty-free products that are also vegan. Why did they leave Leaping Bunny? I am so sad! I only trust brands on Leaping Bunny, and now there are NO salons on there! Came across this page as I was looking for a more updated opinion. I recently contacted PM about their animal testing policy as they are no longer leaping bunny approved. They said they now are selling select products in China. I don’t either but I’m very hesitant to continue using PM which is a difficult decision. Using a Leaping Bunny product that is widely available and affordable made things about as simple as could be. I’m now looking into other hair products. I assume the reason for breaking with LB is so they can sell in China. But I don’t have time to chase down all the particulars of every company’s policy and practices which is why I select only LB certified. Hi, are your products (your entire hair care line to include color and chemical treatments) soy free and nut free? I have allergies to soy and tree nuts.